Who would have ever thought I would find a relevant use for this ticket.......but, this challenge has had me doing something I've wanted to do for some time. That is, learn a bit about the history of the American patchwork tradition. It's an amazing history that despite a bit of digging, I'm sure I've barely scratched the surface of. Using internet sources, I tried to piece together cohesive little story, but I think it is more like the internet - clicking here and then on to another link and off on another tangent. For instance, there is a contemporary component to out patchwork quilting history...some of the patterns I read about were represented at Fashion Week in London this year....so I've included them! Here's a little taste of what I found...old and new. 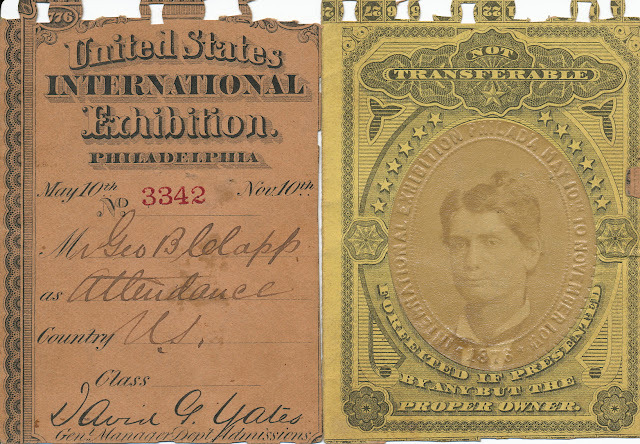 So, first, we start with the ticket.....at the Philadelphia Centennial Exhibition, in 1876, and, in particular, the Japanese exhibit. At the exhibit, people were introduced to the Japanese aesthetic and a particular ceramic style, called crazing, with its fragmented appearance, that played a really important part in defining the Victorian fascination with Crazy Quilting. 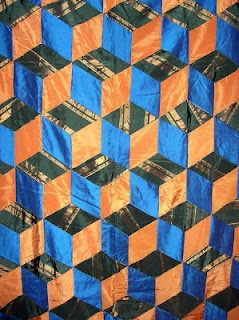 Crazy quilting had been around for a while, as a utilitarian way to fashion bedcoverings out of scraps from garments by necessity. But moving into the late 1870's, crazy quilting started to become more purposeful, with more design elements, employing scraps of silk and brocade and velvets, ornately embroidered, often with eastern motifs, such as cranes and fans. Crazy quilts reached there peak in the late 1880's, but continued to be popular through the 1920's. Meanwhile, pieced quilts started to gain popularity. One of the earliest and most popular patterns was Tumbling Blocks, originally an opportunity for women to show off their fine silk scraps. 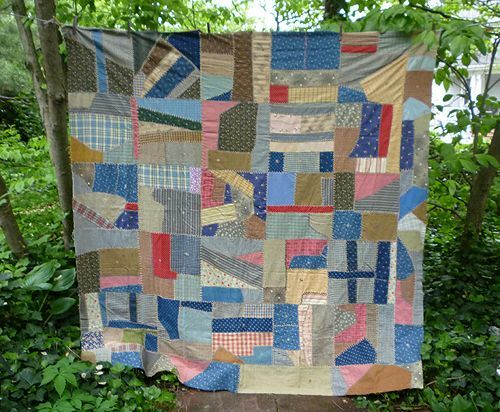 Tumbling blocks is one of the patterns that is part of the theory (now urban legend) of a code for the Underground Railroad, using specific quilt patterns to guide slaves to freedom in the north. I always liked that idea, but historians have since written it off. Holly Fulton, a Scottish designer, working in London, features a number of leather, geometric patchwork garments in her 2013 collections. 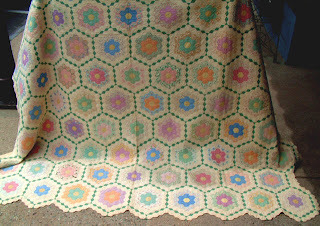 Grandmother's Flower Garden has the distinction of being the first quilt pattern published in a "ladies book" in 1835. The hexagonal pattern had been around in England since the 1700's, though the first American piece was dated 1807. Earlier version were often called honeycombs or mosaics. A fairly common pattern by the early 20th century, this quilt top is often found unfinished, because women just didn't know what to do with the edges to finish it. The accompanying photo isn't from this year, but it was so spectacular, I had to include it. 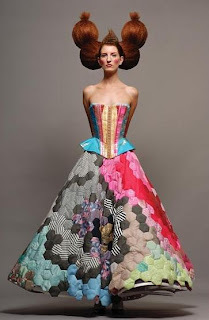 It is from a 2003 collection, entitled, "Narkë, the History of a Dress", by Portuguese designers Luís Sanchez and João Branco, known as Storytailors. The dress is one of many patchwork (and otherwise amazing) dresses included in the collections featured on their magical, storybook like website! The most recent addition to the quilting tradition (that I can think of) is the "modern" quilt movement that is rapidly gaining momentum. At Houston last Fall, some of my favorite quilts were included in the "Modern Quilt Guild" exhibit. Quilts of this genre share certain attributes, including, asymmetry, negative space, more solid colors, and unconventional block structure. Correlations are frequently drawn with Gee's Bend style of quilting. From the Modern Quilt Guild blog: "Modern quilting is just about quilting in a way that reflects you, the modern quilter. It is a style of quilting that reflects your life, your aesthetic, and sometimes your general approach to the world. 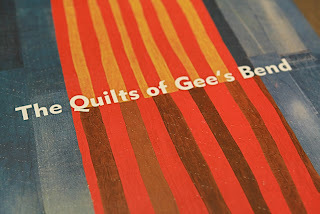 Mary Lee Bendolph, one of the famed Gee's Bend quilters says it best, "I never try to quilt altogether like anybody...It's better if you do what you are supposed to do than to try and copy somebody else." English fashion designer, Paul Smith, has a number of dresses in his 2013 collections that I thought reflected the attributes of modern quilts and by default some of the Gee's Bend quilts. This challenge has made me acutely aware of how little I know about the American quilting tradition - something I'd like to continue to work on. There are so many interesting stories about every pattern out there. 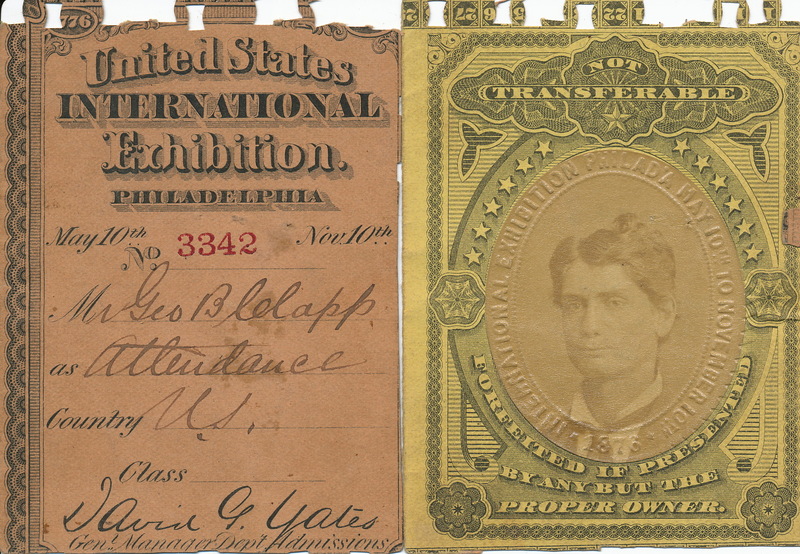 Each of the captions on the photos above will link you to more information about or more photos of the images shown. Any of these patterns alone could fill an afternoon of surfing and reading. It's hard to distill so much information! At this point, I'm fairly uncertain where this challenge will take me, but it has been an interesting journey thus far and I'm really eager to see where others have gone with it! Now *this* is cool. Very cool! Thanks, Margaret! It really was cool to find so many correlations in contemporary things. Great take on the idea of "tradition"! I love the side by side images old/new. 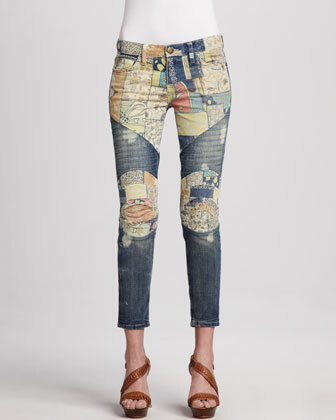 Can't wait to see how you interpret this as an art quilt.